Day 6 - Dec. 12! Remember this code expires at midnight (Eastern Time) and a new code (for Day 7) will be issued shortly after. To ensure you collect all 12 DVDs, check back each day, and follow all our social media channels. To learn more about this special DVD, Pups of Liberty: The Dog-claration of Independence click here. 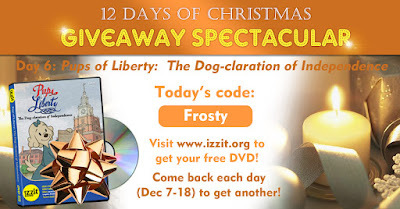 12 lucky participants will also be randomly selected to get an extra surprise in their “stocking” - an embroidered 10th Birthday fleece blanket, which will come in handy when curling up on the couch to stream our izzit.org educational videos on Roku. *No guarantee titles will arrive before Christmas! Be patient with our elves. Limit 1 title per household. Limit 1 blanket winner per household. U.S. residents only. No purchase necessary. We cover shipping & handling. For full rules click here.